Ms. Biles and Ms. Manuel demonstrate what can happen when young people with latent ability and talent are identified at a young age; encouraged by involved parents; specifically trained to develop their abilities and taught to compete to high standards. Not just with their neighborhood peers, but against athletes from across the globe. At the same time that the Olympics are shining a bright light on our most accomplished athletes, so called education reformers, focused on lower income Black and Latino communities, are engaged in a public debate on parent’s school choice alternatives. National organizations such as the NAACP have called for a moratorium on the rapid growth of school choice options such as vouchers and charter schools. These options often give parents, mainly in lower income communities, alternatives to the traditional neighborhood public schools, many of which are known to be failing students and families. The current debate over school choice has also been fueled during this divisive political season by special interests groups that may be more focused on the preservation of the institutional status quo and less on the future success of the children or the families from these communities. We are in a political season where political operatives that wish to shape the policy of political platforms rediscover the Black and Latino community that has mostly been forgotten and ignored for years. These political operatives argue on behalf of those with large budgets, influential networks and agenda driven donors. But these operatives generally do not represent lower income parents, many of which have no choice but to send their children to the mandated neighborhood failing school. Many lower income neighborhood schools are so far behind in minimally educating students to current standards that they cannot engage, encourage or develop students that are academically advanced or gifted. When children with the latent talents to be among the most academically competitive and advanced are not identified, encouraged, trained and supported, the loss to the community is great. When schools are content to solely focus on moving struggling students to the proficiency line, forgetting the rest, lower income communities lose in a big way. And the loss is one that will negatively impact many future generations. Simone Biles, Simone Manuel and the Olympic athletes have shown us what can happen when we identify the best and brightest among us; when they are trained and encouraged; when they have equal access to the field of competition – They can win! Education reformers should be aware that the lessons from the development of our Olympic athletes also applies to the development of our future academic athletes. But instead of figuring out how to create world class students that are globally competitive, the recent debate has been mired in the false choices presented by special interests that are far removed from the communities affected. What we need are good schools. Schools that educate. Schools that can find the best and brightest among us and move them forward rapidly while assisting struggling students to obtain the foundation skills they need. Nearly every parent wants their children to attend a good school that will prepare them for future success. The pro charter – anti charter debate is a distraction as described in this video from Dr. Howard Fuller, a well known honest broker in the education reform movement. Unlike most, Dr. Fuller cuts through the debate to get to the essence of parental choice as he enlightens attendees at the National Association of Black Journalists Annual meeting in DC. NAEP, or the National Assessment of Educational Progress, is often called the “Nation’s Report Card.” It is the largest continuing and nationally representative assessment of what our nation’s students know and can do in core subjects. NAEP is congressionally mandated, and was first administered in 1969 to measure student achievement nationally. The NAEP test is given to 4th, 8th and 12th grade students every few years. NAEP test results are reported by state and aggregated to a national score. The specific results can also be reported by gender and race/ethnicity. The last test was given in 2015. The scaled scores across the bottom of the graph above range from 140 to 350. These scores measure student performance on the 4th grade math test. Scores below 214 are considered “Below Basic“, which means that students do not have an understanding of the subject matter tested. Scores between 214 and 248, are considered “Basic” where students have a minimal understanding of the subject matter. Scores between 249 and 282 are considered “Proficient” where students demonstrate the expected knowledge and understanding appropriate for their grade level. Scores above 282 are considered “Advanced” and obtained by the most academically gifted students. The “proficient” cut point in the graph above is right about where the blue downward line is. This also happens to be right at the average NAEP score for White students, which is also the blue line. 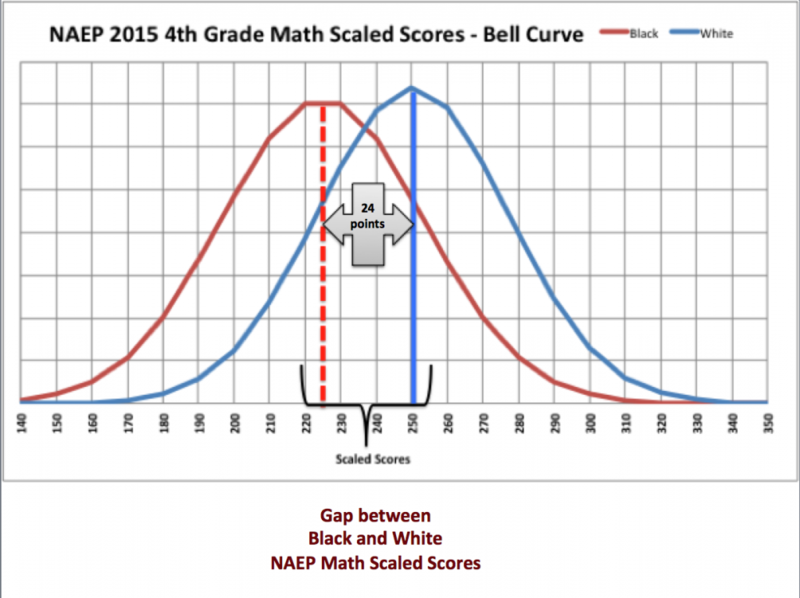 The average NAEP score for Black students is at the red dash line. The “achievement gap” for the latest test in math for these 4th graders is 24 points. The relative position of the bell curves shows graphically the fact that Black students are “on average” behind their White counterparts. This analysis is not new or unknown. In fact the opposite is true. This gap has historically existed and is the focus of many education policy makers, school leaders, government officials and philanthropists. Although much money and resource has been allocated to closing these gaps the national progress has been minimal. However, we have seen pockets of success in a few school districts and within many charter schools. The fact that the gap can be closed in these exemplar schools (with similar socioeconomic populations to failing schools) clearly demonstrates that economic and social circumstance does not have to determine academic outcomes. Many struggling schools are focused on closing the gap to proficiency shown above. But there are children in these schools that could become high achievers if they are identified and nurtured early before they become disengaged and discouraged. Students to the right of the blue line above are considered “proficient” with the expected knowledge and understanding to compete nationally. The further right you go on these curves the more advanced the students are. These two graphs show that the Black community has an urgent need for innovations in education that can rapidly bring a large number of students to proficiency that are to the left of the blue line. 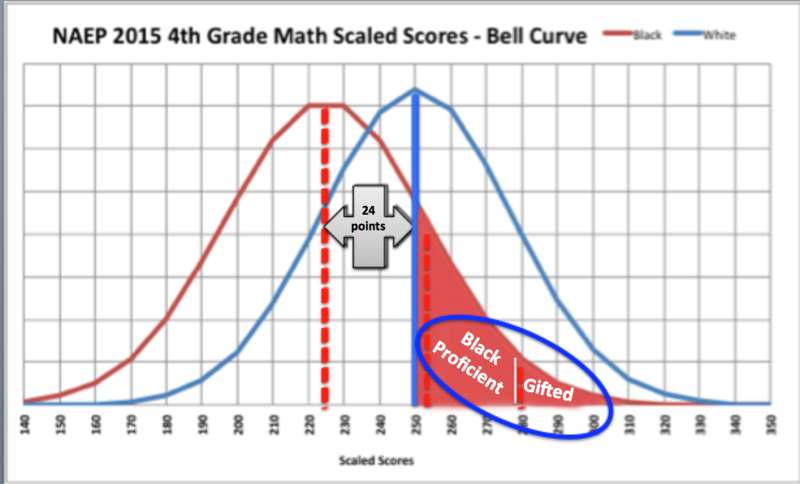 But the graphs also show that there are many proficient and gifted Black students, shown to the right of the blue line, that can be identified, nurtured and encouraged for success. Without that encouragement many of these academically competitive students may lose hope and become disengaged in their ongoing learning. The gap increased from 24 points in the 2016 4th grade math NAEP to 32 points in the 8th grade math test given in the same year. 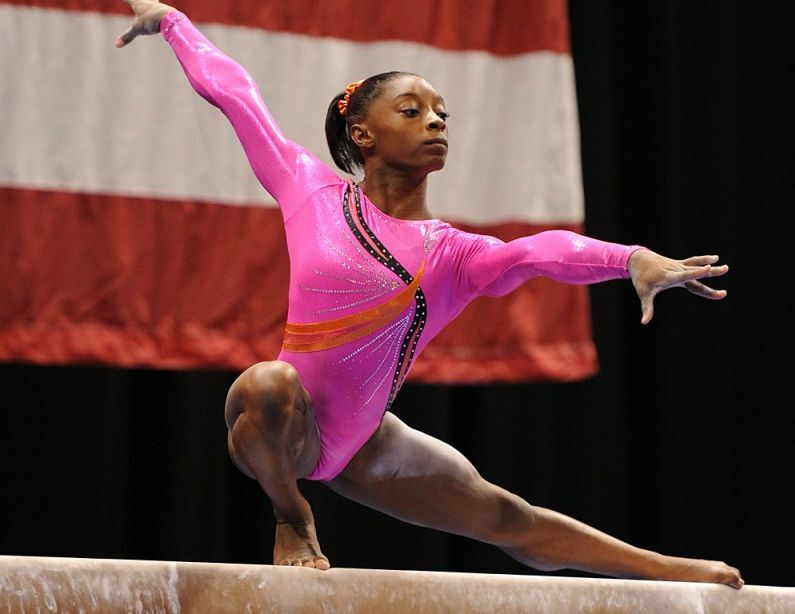 Simone Biles, a star Olympic athlete, needed a coach that worked with her to develop her gymnastics talents, pushing her to continually reach for a higher bar that she was capable of achieving. Too many gifted and advanced Black and Latino students are stuck in dysfunctional schools where their ability to become globally competitive is ignored and wasted. Failing schools rightfully embark on turn around or transformation. But in the process are we ignoring too many of our best and brightest? Lower income communities may be losing future leaders, scientists, doctors, lawyers and entrepreneurs. Education reformers, that are interested in sustained improvements in communities, should place a greater focus on Black and Latino gifted students, especially those in failing schools that have a laser like focus on raising scores to proficiency. 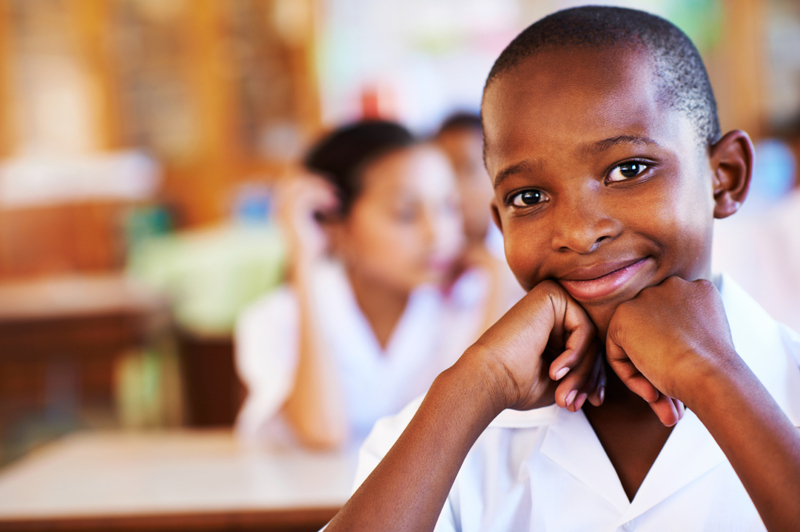 Parents of gifted Black and Latino children in struggling schools may not be aware that their children may be unnecessarily falling behind and not living up to their full potential. For many advanced and gifted Black and Latino students, caught in struggling and dysfunctional schools, day-to-day existence may be filled with boredom that turns into disengagement. Without attention, many of our most promising students may become lost in a world where education reform fails the most gifted while focusing on the most in need. Conversations about education reform have been going on for a very long time. But now we need to recognize that incremental changes to a failing system will not create the future leaders we need to pull communities out of decades of inter generational poverty. Let’s identify, train and encourage our next generation of Academic Athletes – our future leaders.